Environment: Nether and large surface lava locations. Drop: Rare chance of obsidian. Misc: Sapient beings of magma, the Magmen dwell around sources of lava above ground and near large magma lakes in the nether. The communities in the overworld are small, only a handful of Magmen, but the Nether communities are large and could have as many as twenty residents. The Magmen view water much as humans view lava, a dangerous and pesky material, especially on the surface. They take damage from water as humans take it from lava, but do not catch fire. Conversely, lava/magma are the life source for the Magmen, and they cultivate a rare plant called the Latern Tree, which does not grow very large. It bears a fruit called the Latern Fruit, which the Magmen eat. The plant requires molten lava to grow. Magmen will divert magma sources to create small gardens to grow these trees. The fruit are useful as they emit a large amount of light for a very long time even after being picked. Along with some glass, to contain it, the Lantern Fruit can be crafted into a very bright lantern that lasts for a long time. Instead of a being like a torch, that gets mounted to a wall, the Lantern would use the mobile lighting technology that has been developed. The wood of the trees can be used to make boats that float safely through lava. Getting in and out of these boats is very dangerous! The player can interact to some degree with the Magmen colonies. If the player attempts to steal the valuable Latern Fruit, he/she will anger the Magmen and likely end up on their bad side. But if the player brings lava to irrigate the farms of Lantern Trees, the Magmen will being to like the player and reward him with gifts of ripe Lantern Fruit. Of course, flooding a Magmen colony with water will result in outrage. I think the use for the Fruit could be changed, it was just my first idea. Also, Magmen would occasionally tame Salamanders. Pretty cool. I like the idea with the trees but the graphic for them might need some work. Just my suggestion. Also i am a bit confused about the lanterns...will they run out of light or will they be aglow forever? Agreed on the graphic, I'm working on a better one now. I would say that it would be permanent, but I don't think that the fruit as as good a benefit or as creative a one as it could. So I hope some people have some good ideas. I'm open to a lot in this case. Maybe in order to keep it from rotting you have to keep it close to a source of water? ( I know you cant place water in the nether but why would you need light in the nether? Its full of fire and lava anyway!) But if it does rot..Maybe the smell attracts monsters and maybe sometimes and rarely the Magmen come up to the surface and guard it. If you dont like that like i said it could attract all hostile mobs to the fruit. Maybe if you get within a 3 block radius it puts a smell on you similarly to your dragon claw ( I think) and that would attract mobs to it also. Idk its just a idea. Basic model for the Lantern Tree added to OP. The textures will be re-colored leaf and wood textures. Ya i like that tree better. LOL and with the third picture...is it sitting down or something? Its a good idea, because there is no danger around lava atm. 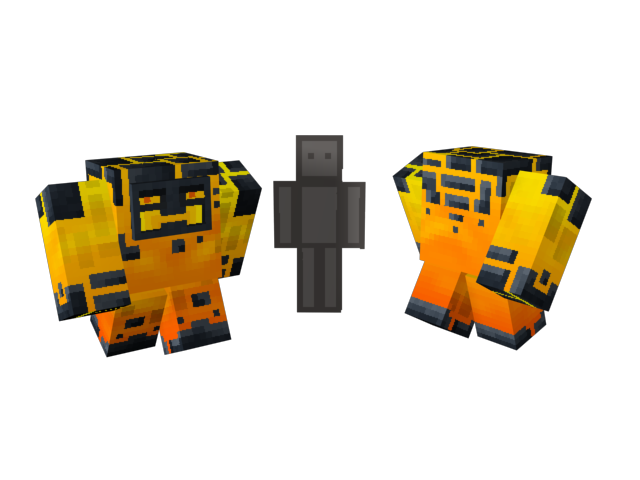 Making a dangerous mob living in lava would make it more interesting... And not overpowered, just bring bucket of water. Do they live in the lava, near it, or both? Also, I don't like the current graphic all that much. It looks a little bit rushed. It's still pretty cool though! It would be great for a sentient mob. Perhaps, the Magmen and the zombie pigmen could be hostile towards each other? They live near it, as we live near water. I actually worked pretty hard on the graphic. I think that the biggest problem is that their glow is not really represented and I would want the actual molten part to be animated as if it were flowing and changing mildly in tone and color. But that is difficult to do. Interesting, so kind of like the Nether's version of the Grove Sprite? Also, how would they attack? Melee, fireball, etc? But seriously, they could attack with their fists or with various weapons. I like the idea of them having spears. Maybe they punch when close up but when you're out of reach, they throw lava balls? However, if you like the spear thing, how about this. When in range, they will stab you with the Spear, when out of Range, they will throw. However, each Magman only has one spear, so they will have to attack a different way, may it be through mini Ghast bombs, lava balls or other. EDIT: Also, I think Flaming spears would be cool, or maybe just super heated spear heads causing alot of knockback. I have thought of a design that would be used to draw in monsters, I don't think it fits with this design. It could be dropped in water to create a diamond. Or possibly a super hard ore that would make really nice weapons. Well, as it's a fruit, how about you can eat it and get something. Like maybe, you'll get night vision for a short period of time, or you'll glow, allowing you to see where ever you go, but the light would blind mobs (limited time obviously)? Maybe the fruit would last forever, but eventually dims to one block radius? Maybe, but I kinda feel like eating one would kill you, since it's basically juicy with lava. Maybe you could attempt to feed it to the Magmen :tongue.gif:. Well, if it's juice with lava, how about you can throw it? When it hits something it'd "pop" and lava would go over the near by area (2-3 blocks away in all directions). The lava would NOT be source blocks.